One of the most unique lake vessels to sail through the Twin Ports was the M/V Incan Superior. While it operated from 1974 to 1992, this vessel and its operations are often overlooked in the history of shipping on Lake Superior. She was a railroad car ferry—a flat decked rail car carrying ship—that operated on the big lake hauling railroad cars between Thunder Bay, Ontario, Canada and Superior, Wisconsin. Essentially, the Incan Superior was more of a train than a boat. The Incan Superior was a Canadian vessel owned by Incan Ships, Ltd. and built by Burrard Dry Dock Company in North Vancouver, British Columbia and designated as a ferry. With twin screw propellors powered by twin General Motors diesel engines of 2,150 horsepower each, she was capable of reaching speeds of 30 knots, making her the fastest freight carrying ship on the Great Lakes. Made of steel, she was 373 feet long, 66 feet wide, had a depth of 23 feet, with a gross tonnage of 3,838. Flat-decked railroad car ferries like the Incan Superior have served railroads since the turn of the last century. Most of them were locally built, slow moving, worked across rivers, bridged islands, or connected two communities—sometimes in different states. But none were as streamlined, as powerful, as fast, or as widely traveled as the Incan Superior—not during her days on Lake Superior. Launched on February 28, 1974, the Incan Superior made the long trip from North Vancouver down the west coast, through the Panama Canal, up the eastern seaboard, down the St. Lawrence Seaway, and across the Great Lakes to her new home in Thunder Bay. Upon arrival a crew quickly readied her for her first loading. The whole reason for Incan Superior‘s existence was to allow the Canadian Pacific Railway (CP) to create a revenue stream from the blossoming paper industry. Large quantities of newsprint paper were needed in the U.S. Although Thunder Bay’s Great Lakes Paper Company was producing paper and pulp needed south of the Canadian border, CP had no direct rail route into Duluth or Superior to ship those products to the U.S. So instead of building a new railroad line CP created a direct rail-water link using a car ferry system between Thunder Bay and Superior. The CP handled the railroad switching chores in Thunder Bay, moving empty train cars off of the boat and placing loads back in their place. 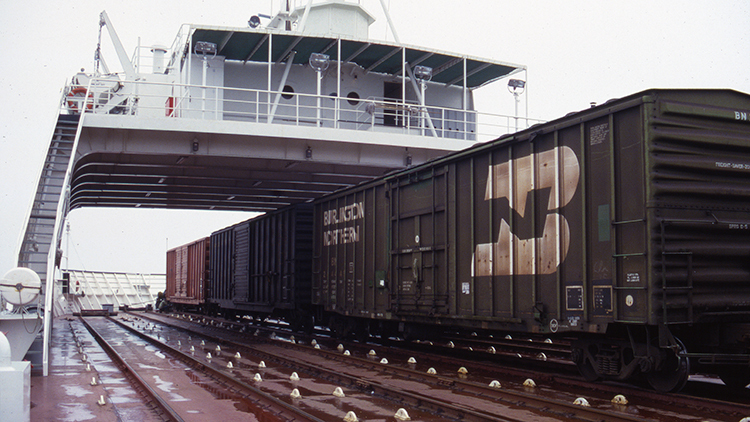 The Lake Superior Terminal & Transfer Railway (LST&T or Terminal) in Superior performed the exact opposite ballet, taking the loaded cars off the boat and replacing them with empties. Vessel loading and unloading was always accomplished under the watchful eye of the ship’s captain. The deck of the Incan Superior was fitted with five tracks that could carry up to 32 40-foot boxcars or 26 50-foot boxcars. Loaded cars carrying newsprint paper rolls would make the southbound trip from Thunder Bay to Superior; empty boxcars made the return trip from Superior to Thunder Bay. In later years of operation the cargo carried by Incan Superior wasn’t strictly newsprint. Chemical tanks cars and covered hopper carloads of grain and fertilizer occasionally made the trip as well. This was especially true after newsprint revenue began to decline during the 1990s due to increasing all-rail and truck competition. Generally speaking it took about four hours for the railroad crews to unload and reload the vessel at either end of the trip. The Incan Superior usually left Thunder Bay at about 8 p.m., arriving in Superior pretty close to noon the following day. The Captain backed Incan up to the [loading] ramp. Now the big test was to begin. The rail track on the ramp was built in Superior, Wisconsin. And the track on the ship’s deck was built 2,000 miles away in Vancouver, British Columbia. When the ramp was lowered to the deck of the ship, the tracks were supposed to match up so the rail cars could be loaded or unloaded. But would they? All the bigwigs scurried up the ramp to check on the track lineup. To their great surprise, each set of tracks lined up perfectly. A loud cheer went up, and everybody was congratulating everybody else and slapping each other on the back. The one lonely rail car ran over the tracks, down the ramp, and onto the shore. Everything worked. The bigwigs headed [downtown] for their cocktails and feast, and we secured the ship for the night. Our crew went uptown for beer and pretzels. The Incan Superior ended her operations on Lake Superior in 1992 after her last run from Superior to Thunder Bay on November 19, 1992. It was the last leg of an astonishing 2,386 trips between the two Lake Superior cities. This end became inevitable when a competing land-based railroad route, operated by Canadian National Railway became a less-expensive method of moving the same cargoes. A new U.S. federal tax was to go into affect, applied to each rail car carried over the water between the two countries by vessels such as the Incan Superior. The tax rendered the vessel unprofitable to operate, and the entire program was quickly abandoned. 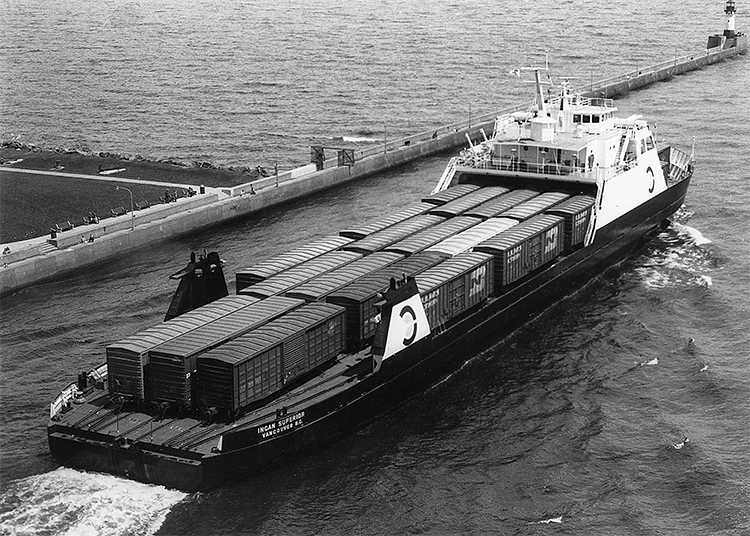 In November 1992 the Seaspan Costal Intermodal Company became the new owner of the Incan Superior. Seaspan brought her back to British Columbia, again via the long trip through the St. Lawrence Seaway and Panama Canal. There she began car ferry operations for CP in the Straits of Georgia, hauling rail cars and road vehicles between Vancouver and Nanaimo on Vancouver Island. Her appearance changed a bit when her bow was cut down to allow loading and unloading from either end of the vessel. She continues in this type of service today. During her career on Lake Superior, countless onlookers watched the Incan Superior pass through the Superior Entry or the Duluth Ship Canal, and many snapped a picture or two as she glided by. While she is no longer part of the activity of the Twin Ports, she is still in service and remains an important part of Duluth-Superior’s transportation past.